During my visit to London last week I made the pilgrimage that all tennis fans should do once in a lifetime, I took the train to Wimbledon. The grounds are located in the suburb of Wimbledon, which was a good 40 minute train ride and walk from my downtown hotel. The museum/gift shop was open and they even featured a look at centre court. I thought it was cool that the last match played at last year’s tourney was still on the board. 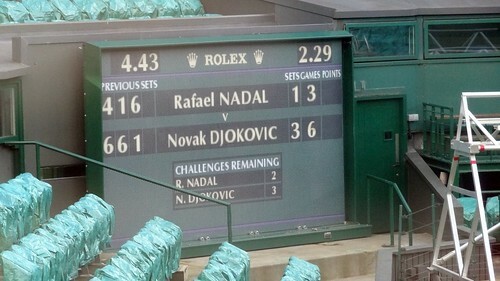 Looking at it now, I see that it was a short, 4 hour and 43 minute victory for our beloved Serbian champion, Nole! It was great to go through the museum and learn about the history of the game. Professional tennis does not really have a long history. For hundreds of years it was a recreational game played by royalty and the upper classes. The highlight was a talking hologram of John McEnroe talking about his Wimbledon tournies. Wimbledon is one of the four grand slams and I see how the traditional and reserved British culture is appealing to the players and tennis fans. It is a much different tourney than the other grand slams – a lot less commercial. Centre Court is very small and the grass is surface that few tourneys are played on. It was like visiting Lambeau Field for American football or Wembley for soccer. I hope to come back in July and see it in action.